This entry was posted in Christian Living, Pastoral Issues, Persecution and tagged 2 Timothy, America, Christian Persecution, Jesus, Matthew 5, New Testament, paul, Persecution, theology. Bookmark the permalink. ← Will There Be a Church in Egypt? No disagreement from me! 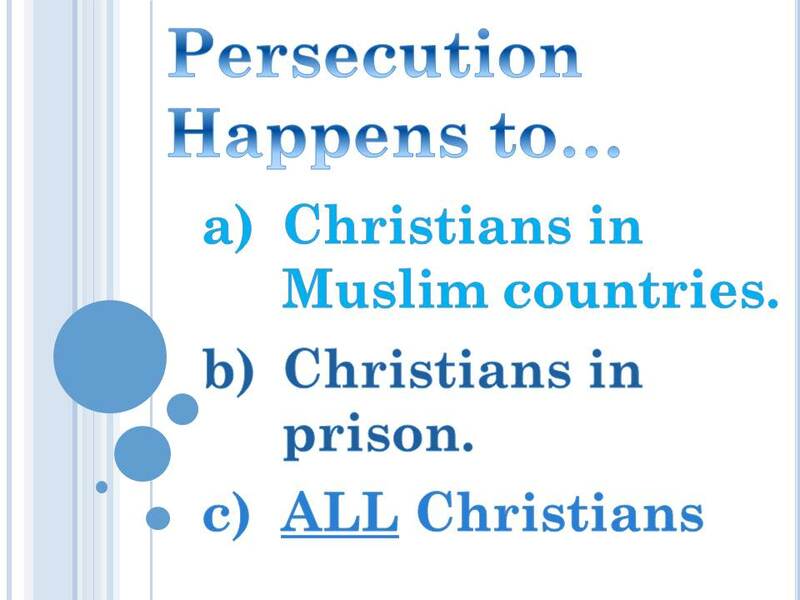 Until recently, I too held the perspective you speak of…that persecution happens elsewhere. Not here in Australia (or in the USA and other ‘western’ nations). Then I began to experience it firsthand, in many different forms…some subtle, some obvious. As the Lord brought me out of my rebellious wanderings and opened my eyes and ears, it began. I realised that in living as a worldly Christian (or maybe not yet regenerated), I was barely an offense to anyone. That should have been my clue to my true spiritual state! In a short few years, I like countless others before me have lost much to follow Christ (in my case, a spouse), and no doubt will suffer more in the future. That is what all believers can expect. But oh, how much we gain…Christ, his forgiveness, his love and his righteousness! During this time, I have felt very blessed to connect with and learn more many brothers and sisters in Christ overseas. I have found that many are suffering for the Gospel, although not necessarily through forms of violence. However, regular criticism and ridicule, job losses or discrimination at work or school, rejection by churches embracing false doctrine, and the loss of an unbelieving spouse or friends are just some of the daily experiences of true believers. It is this very suffering that should help us feel a strong bond with our brethren that are suffering abuse, violence and even death, and to love them and pray earnestly for them. It is an awesome mystery, being united in Christ. Thank you for your online shepherding, Greg. This weary sheep appreciates it greatly. Wow, Narrowing Path, I cannot thank you enough for sharing your experiences. I’m so glad to hear from you because I honestly get quite a bit of pushback when I explain this dynamic to folks. Your experience tells the story well. I am so sorry for your loss, but I am very thankful for your faithfulness. May the Lord Himself continue to bless you and keep you in Christ.